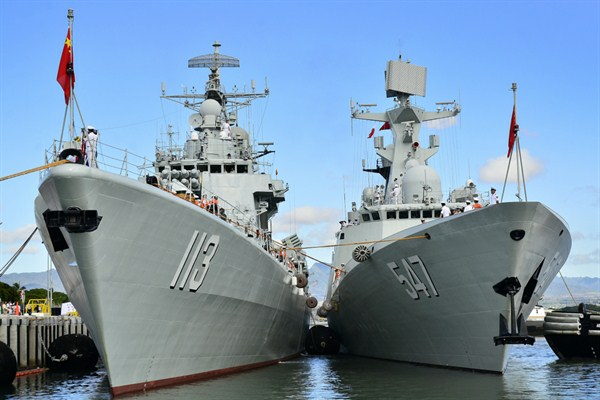 The Chinese People’s Liberation Army-Navy Jiangkai-class frigate Linyi moors alongside the Luhu-class destroyer Qingdao, Joint Base Pearl Harbor-Hickam, Sept. 6, 2013 (U.S. Navy photo by Daniel Barker). This month, the heads of the world’s navies and coast guards converged on the Naval War College in Newport, Rhode Island, for the International Seapower Symposium (ISS). ISS assembles distinguished international naval leaders to enhance common bonds of friendship and to discuss challenges and opportunities, this time under the theme of “Global Solutions to Common Maritime Challenges.” This was the 21st iteration of ISS, which was first held in 1969. It was the first with Chinese attendance.